i have a pb3400 running 9.1 and an iMac running tiger. have had no problems setting up file sharing using the chooser under classic but have had a strange problem where the server "unexpectedly closes down" all the time. In a mixed environment, I've found that sharing OS 9.1 works better than sharing OS X. You didn't indicate which version of X you are using. I have the same problem if I try and access the internet during the 10.4 to 9.1 network access, but if I don't do any internet access, just a closed network, then everything is fine. Does this help at all? I had a number of clients have this issue when Mac OS X first came out (they continued to use the Chooser in Classic to make network connections)... Classic wasn't design to work this way, which is why the connections keep cutting out on you. To network 9.1 and 10.4, you'll need to make sure that AppleTalk is on on the 10.4 system (both in the Network preferences and using Directory Access (make sure AppleTalk is checked). The thing to keep in mind is that AppleTalk in Mac OS X is not "old" AppleTalk, it is based on AppleShare IP. This shouldn't be an issue with Mac OS 9 as it came with a "lite" version of ShareWay IP (which you should make sure is on in the Extension Manager). Connection from Mac OS 9 to Mac OS X is just going to the Chooser, selecting AppleShare, then typing in the IP address of your Mac OS X system. Note that once you have mounted a Mac OS X volume an alias for it should be made in your recent servers folder. You can now skip the Chooser altogether by selecting this alias in the Apple Menu which is already associated with the IP address of your Mac OS X system (only works if your Mac OS X system doesn't constantly change addresses... on my network, even systems using DHCP have constant IP addresses, but my systems are all on 24/7). Connecting from Mac OS X to Mac OS 9 should be pretty easy. 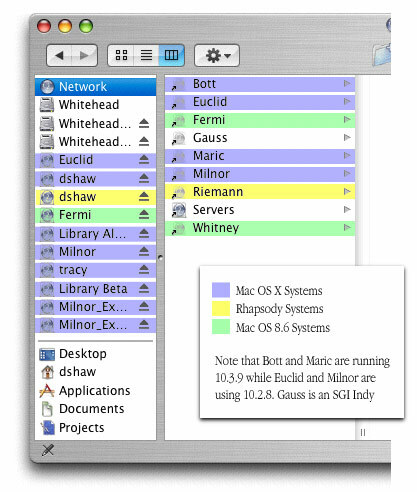 Open a Finder window and click on the Network icon in the side bar... all available servers should show up. You can find a snapshot of what my network looks like in my Finder here. My network is made up of systems running Mac OS X (10.2 and 10.3), Rhapsody (5.1, 5.5, 5.6), Mac OS 8.6 (full systems and Blue Box) and IRIX (5.3 and 6.2). The primary protocol I use is AppleTalk.